Lunch today was very special! A walk around the yard yielded several ingredients for an egg scramble that also used up some things that were needing to be eaten soon. Tame items included eggs, some mushrooms, fresh salsa, cheese, ham, and butter. Outside I found chickweed, tender dandelion leaves, and some young garlic mustard leaves. Rather than cutting into a whole yellow onion, I yanked a wild onion from the mint patch (multi-tasking at its best). While the chopped onion and mushrooms simmered with the butter, I chopped up the greens and mixed them into the eggs along with the ham. As they became tender in the pan, the egg mixture was poured over them and stirred. After the eggs set well, everything got a quick flip, and a hefty topping of salsa and cheese. A few minutes covered to heat through - delish! Be sure to add some wild yard weeds to your diet this spring. It adds a little something special to any dish you prepare! This day needs to be memorialized so that if ever I start feeling like things are going wrong, I can look here and remember what that really means. It started early. Time to run charges before shipping orders. No problem, right? Wrong. The internet program needed to be updated. It's the only thing the Ipod Touch is used for, so it took a few (panic-filled) moments to think of doing a reboot. Okay, onward. Got a notice for State Sales Tax the other day, so that's a 10 minute job to do right quick before printing mail labels. Hop on the big computer, and it turns out the virus protection is expired. No problem, there's an auto-renewal. But for some reason I couldn't access the file. After over 1/2 hour of searching for a contact # and nearly beating my head on the desk several times, my first question is about the extra $20 they charged me. The guy on the phone and I both laughed heartily when he told me that was the charge for the renewal notices they've been sending me! Hahahaha - cancel that, give me a refund, I can remind myself. The next hour was spent getting the program loaded onto the computers. Quick and easy sure means something different to me than it does to the virus protection company, but in the meantime there's time to print out those mailing labels. Oh-oh, the USPS site is down. Dang! Okay, okay... I'll just pay those Sales Taxes and maybe it will come back up. Where the heck did that file with ALL the sales for 2011 go? Search, search, search... oh look, somehow that was deleted last week! Fortunately, my website held all the info so that I could recreate the file... because, you know... I've got nuthin' but time. Finally success - taxes paid. Now let's get back to those labels. Oh look! The Post Office is closed now, so it's too late for today - but the site is up, and I ripped through those labels and hit "print". And waited for the wireless printer to start spitting them out. And waited... nothing. Ah hahahaha! The update to the virus protection must have taken the printer offline. hahahahaha.... look at all my hair on the floor! hahahaha. There's another half hour of fumbling around. And then they print. So now it is 6:04 in the evening, and I've eaten my first meal of the day while typing this out. In a minute, I'll head down to make a couple batches of soap (that should go well...) and finish the last details of the magazine to send to the printer tomorrow. 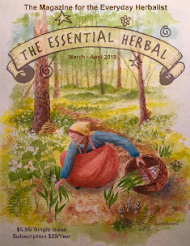 I took a moment out from work on the May/June issue of The Essential Herbal magazine yesterday, specifically to record what is going on outside. Mid-March looks suspiciously like late April. Above, you'll see that our Rosemary didn't just survive this year, it is preparing to bloom. Echinacea is coming up. We are way past worrying about a frost - if it happens, there's nothing we can do to save the peaches, apples, blueberries, and cherries that are starting to bloom already. Gooseberries had tiny buds on Saturday that burst into leaves yesterday. Many years, we are still under snow at this point, however we've already had a month of warm weather. Elderberry is busting out all over. The furnace hasn't run in weeks, and the windows have been open daily. Comfrey is starting to grow through the debris from last autumn. The "lawn" is full of speedwell, purple dead nettle, and shepherd's purse. It will need a good mow, which usually happens for the first time each year in late April or early May. The easiest way for me to put a time-table on this is to remember that as a child looking for blossoms for May Day bouquets, there might be a few violets, perhaps some dogwood, and dandelions. This year, I can only imagine what will be blooming by May. We have a full week of 70's forecasted ahead. Could it possibly be that our last frost was in February? 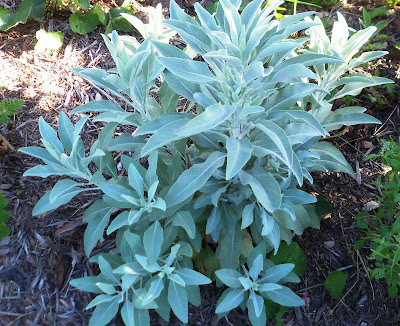 Yesterday in our class, we distilled Salvia apiana, better known as white sage. 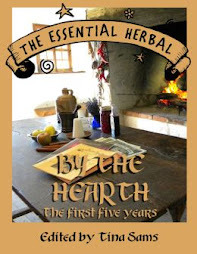 Our first introduction to this fragrant ceremonial herb was during our renaissance faire days, when prior to opening each day, someone would light a smudge stick and wander through the shire, with the smoke winding through the streets, shops, and around each of the inhabitants. It was an enchanting way to put us all into a peaceful, communal place, ready to welcome our guests. We burn it often, usually a single leaf at a time, to clear or cleanse the air to make room for new ideas and energy. 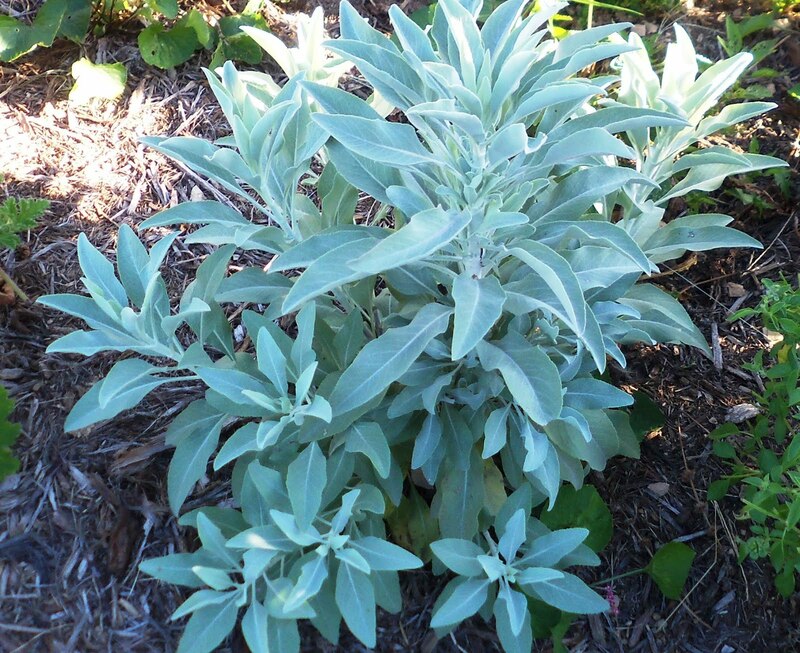 The leaves infused in oil make a highly fragrant oil that can be used as is or made into a balm. The leaves can also be used as a tea for inflammation. And so, it is no wonder that we've been growing our own here, and also eager to try it in the still. To begin, the first thing to do is fill the biomass container. As you will see later, this globe will be where the magic takes place. Once filled, we're ready to assemble the still. After all the parts are fitted together and the pump is submerged into ice water to cool the condenser, we turn on the heat and wait in anticipation. I explained to the class how the equipment functions, and also described other methods of distilling plants at home with household items. We were absolutely astounded by the amount of oil that we were able to obtain from this batch of leaves. 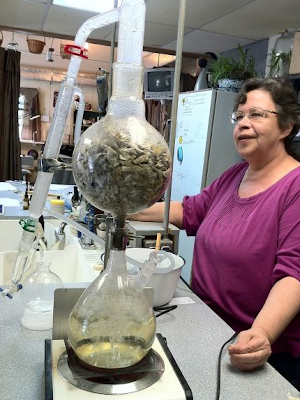 Distillations are typically done with fresh plant material. For the purpose of demonstrations, it is often necessary to use dried plants due to availability. We have found that because much more dried material fits into the biomass container, we've been able to get oil from things like rose petals and chamomile flowers, when none was obtained from fresh material. The room filled with scent of sage while we watched, transfixed by the droplets falling through the condenser and into the separator. 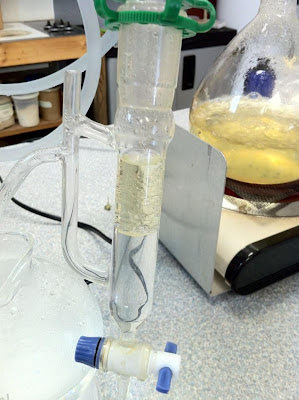 There is a toggle at the bottom of the separator that allows us to release the hydrosol below the oil, capture the oil, and bottle that separately. We got nearly 1/3 ounce of the oil and over a pint of the hydrosol. We shared some of each with our class participants. The first country skill we learned after moving to a rural agricultural area was Composting. We had composted on a very small scale at our other house in the city. We didn’t end up with huge volumes of compost but it was very nourishing to the Rose beds. We had always dreamed of having a couple acres, and enough room for a large vegetable garden. So, we found an old farmhouse that needed TLC, moved out of the Hood and are receiving an ongoing education in country living skills. We began serious composting three years ago. We piled vegetable scraps, grass, leaves, etc., into 3x4 foot mounds on a back half-acre of our property. We chose that particular spot because we didn’t know what we were doing. We were afraid large piles of compost would stink or draw bugs if they were too close to the house. There were a couple of problems with that choice, in hindsight. Compost piles need to be watered down frequently with a hose in warm weather. It helps a pile to heat up better if it is kept moist, about the consistency of a slightly wet sponge. The particulars have to do with bacterial action. Water was not easily available, early on, as we had not yet repaired the broken irrigation lines that fed that part of the property. We had to drag hoses and portable irrigation pipes 30-50 feet to get water to the pile. A properly active compost pile will not stink! The center of the pile should be uncomfortably hot if you push your fist into it. It was also very inconvenient having the compost pile so far away from our house. Taking the kitchen scraps all the way out, around and behind the shop to the pile every day got old, fast. When my husband suffered a work injury, we realized we would either have to abandon composting temporarily or find a simpler method. Three years later, through trial and error, Mother Earth News and a few inspiring neighbors, we have discovered what works, and what doesn’t, for us. Our compost is fluffy, smells like wet earth, and is a beautiful, rich dark brown. Good compost acts like a super vitamin to most plants. DON’T add leftover herbs generated by herbal oil infusions to your compost pile. We learned the hard way that oils and protein-type scraps attract Rodents, Skunks, and Raccoons, and slow down the composting action! A Rat ran out of our compost within days of adding the oil soaked herbs! DO add as much fresh Comfrey and Coffee grounds to your compost as possible. Comfrey is a great compost activator, and is loaded with nutrients. Some people intentionally grow extra Comfrey for just that purpose. Egg Shells are another great addition, but need to be ground up or run through the chipper prior to adding them to the compost pile, as they just don’t break down easily. I read somewhere that some people save eggshells till they have a blender full, add water and puree them…then pour it onto the pile. But old eggshells really stink! I tried it once, and I’m not going there again. Our neighbor, Mike, has a near perfect Mr. McGregor’s type vegetable garden anyone would envy. He shook his head in disgust the first time he saw us worrying over our compost pile. When we told him we planned to have an organic garden, he tried as hard as he could to be polite, and then started laughing! He told us that if we wanted to grow a big garden like his, we should just load up on Manure and some weed killer. Last summer, though, our organic sweet onions were bigger and juicier than his were! (O.k., so were our weeds) But guess who else in our community started composting last summer? Our first summer here, one local orchardist drove painfully slowly each time he passed our property, clearly scrutinizing us with a baleful eye. Occasionally he would stop to ask how our weeds were growing. I should add he was usually on his way to meet other local orchardists for their weekly breakfast get together and gaggle. Pretty soon we had 3 or 4 of them stopping by (with a bratty twinkle in their eye), to ask how that or-GAN-ic gardening was going. We pretended we didn’t “get it” and were friendly to them all. Now the local orchardists bring us apples and pears, and sometimes stay for a cup of coffee. You can begin composting quite simply by making large mounds of scraps and shredded debris from your yard. But you’ll need some muscle nearby. You must turn the piles over with a pitchfork every few days to ensure the contents cook evenly. Big piles hold the heat better than small ones. The edges of the pile can collapse when you turn them, which leads to heat loss and even more turning. My husband eventually had the genius idea to stack some abandoned cement blocks to build three “shared wall” composting stalls, each about 3 x 4 feet. The holes in the cement blocks allow air to reach every part of the compost and the blocks help to contain the edges of the piles. The cement blocks help the compost pile hold on to residual heat as well. My husband found a small, used Chipper/Shredder on Craig’s List, for $100.00. We learned that it helps to shred the twigs, weeds, grass, leaves, and vegetable matter together before combining them into a pile. Compost will heat up twice as fast if the pieces are of a uniform size. We shred it one more time after the pile is done cooking. The end result looks and feels like rich potting soil. The Chipper/Shredder is a tool we would never want to be without. I have learned not to add Rose trimmings to the mixture in the chipper, though. No matter how finely you process them the thorns remain intact, and will find their way into your hands when you are weeding your garden. We keep a 3 qt. bucket with lid in the kitchen, lined with a recycled plastic grocery bag. It works well as a place to store kitchen scraps and peelings until we take them out to the compost pile, which we do daily. Initially, we just used recycled bags to throw scraps in. Fair warning, sometimes the bags leak! Ewwww. Don’t worry about having exactly the right equipment if you want to learn to compost. Good information is available in books, online and from your local extension service. Many methods work. The biggest hurdle you face is making the commitment to do it. Then one early morning next autumn you’ll see steam rising from your compost pile. You’ll know you got it right, and your garden will thank you! Sun, sun, sun - Here it comes! With apologies to all who struggle with the semi-annual time changes, I am fairly a-flutter with joy over springing ahead and having an extra hour of daylight in the evening. For as long as I can remember, the autumnal shortening of days has felt very much like a slowly thickening cocoon that makes me dull and lethargic, while that magical moment when the light continues past 7 pm is when I burst from the dingy and dreary confines of the cramped indoors of winter and spread my wings to dry in the light. We've had some spectacular days in the past few weeks. It has been unseasonably warm all through the winter, but the past month has been peppered with 60 degree days. At this time, we herbies are seeing through different eyes. In a few short months we will be all but taking for granted the extreme beauty that nature will set upon our tables, but right now we are seeing every tiny bit of it fully. The barely visible yard weeds are now putting forth an effort that we reward with oohs and aahs, as their minute pink, blue, and yellow blooms catch our eyes amidst the pale hay colors and the bright young grasses. We brush aside the leaves and debris of fall and winter to invite the shoots of new growth to come forward and delight us with their scents and flavors. The smallest hint of what is to come fills us with hope and dreams and anticipation. We see it all, and we fall into that helpless love that overtakes us as one in this swooping, grand, luscious blush of springtime. We believe that this is the year that we will be able to stay ahead of our garden work. We are still far from the realization of insect stings, plant induced rashes, sweat stains, and strained muscles. This is the honeymoon for herbies. And so we should enjoy it with every breath we take. Smell the freshly turned earth and feel it in your hands. Turn over a rock or 10 to see who lives there. We'll watch the horses pulling buggies - enjoying their work in this fine weather that is neither too hot nor too cold, and watch for the birth of adorable farm animals. We'll marvel anew as each of the flowers that we await each year appears again, as if we'd never seen it before. There is nothing in the world as full of promise as springtime. I gladly sacrifice an hour from last night to welcome this with open arms and heart! And yes, it is still possible that we'll have a snowfall - but I'm choosing to ignore that today. Celebrate International Women’s day the Herbie Way! 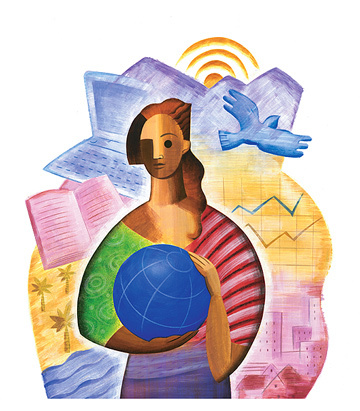 Each year around the world, International Women's Day (IWD) is celebrated on March 8. Thousands of events occur not just on this day but throughout March to mark the economic, political and social achievements of women. Organizations, governments, charities and women's groups around the world choose different themes each year that reflect global and local gender issues. If every International Women's Day event held in 2012 includes girls in some way, then thousands of minds will be inspired globally. I read an article by Arlene Manturano and put together this program idea I thought I would share. It would be great with a girl scout troop or similar organization or even with your own family or home school group. My herb and spice cabinet conjures thoughts of faraway places and long ago events. The mere whiff of an herb can evoke a memorable meal: my grandmother’s Thanksgiving turkey dressing (sage), and mother’s long cook roast beef (bay, marjoram) or my favorite soothing blend with chamomile given to me when I was sick as a child. 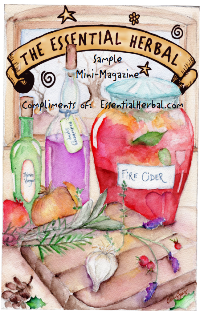 Herbs speak to our first, most primitive and direct sense, smell. A scent is an instant message and memory. The search for mysterious and magical scents from herbs and spices spawned the Age of Exploration. Early explorers found the world to be a highly scented map. Immigrants not only transplanted their families to new places but also brought their native herbs to grow and use in new lands. Students can simulate the Age of Exploration by growing herbs, drying them, and researching their native habitat and present-day growing grounds. 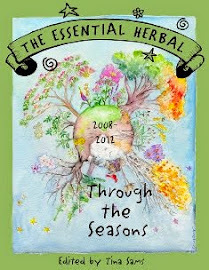 In the process, they reenact the migratory path of herbs now seasoning the globe. Their findings can be represented in herb-scented maps, aromatic reminders of Vasco da Gama, DeSoto, Columbus, and Magellan among other adventurers who for over two centuries of unprecedented exploration charted the map of the world we know. Each herb is native to somewhere on Earth. However, the native habitat is not necessarily the country known for using the herb in its cuisine or where commercial quantities for worldwide distribution are grown today. For example, basil is native to India although best known for use in Italian cuisine. Today’s major commercial supplies of basil are grown not in India or Italy but in Egypt’s Nile River Valley. 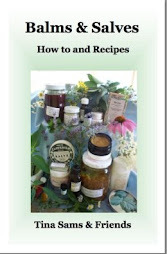 There are many excellent books on herbs with historical data for students to use but also direct them to the websites of commercial growers like McCormick, Spice Islands, and C.F. Sauer and the Herb Society of America. Growing herbs from seed is easy indoors under florescent lights or along walls of windows. Some herbs like rosemary are easy to propagate from cuttings. When seedlings are 2-3 inches transplant to 2-by-2 inch pots. As plants mature, students should snip stems and bundle them for drying. Hang bundles upside down in a sunless dry location with good air circulation. Cool and fun hardy herbs for the fall outdoor garden include bay laurel, parsley, sage, rosemary and thyme along with chervil, chives, garlic chives, oregano, salad burnet, and winter savory. If growing herbs isn’t an option, mapping the world in native herbs is still possible with an instant alternative – containers of dry herbs from the home pantry or grocery store shelf. One can play with aromas. Draw or trace the native country of the herb on cardstock or drawing paper. Cut out the map and print the country and names of native herbs on the map. Spread a thin layer of craft glue across the map and sprinkle dried herbs for that country atop the glue. Allow 24 hours for the map to dry before covering the entire surface with clear contact paper or laminating film. Punch a hole in the top of the map to attach a yarn loop or braid in the country’s flag colors. Construct a trade route by hanging herb-scented maps throughout the classroom, or send maps home to scent kitchens. Growing aromatic herbs with children brings history to life by opening a memorable route to learning about the distant past and contemporary seasonings.